Located in the heart of the vibrant multicultural city of Durban, the Olive Convention Centre is the latest addition to the many world-class facilities the City has to offer. Situated within Durban’s Golden Mile, the Olive Convention Centre offers a practical, user friendly and technologically advanced meeting facilities, with seating options ranging from cinema to classroom, banqueting to boardroom style. Boasting over array of multi-purpose venues and a host of breakaway rooms and boardrooms, combined with some of the most technologically advanced facilities, the Olive Convention Centre’s versatility, flexibility and professionalism is what has led to its immense success, and earned the Centre an enviable reputation. The Olive Convention Centre is proud to have implemented a number of green building initiatives that assist in reducing its carbon footprint. These include energy efficient lighting, the recycling of rain water for non-potable use and timers for high voltage operational equipment. The Olive Convention Centre is equipped with three serving kitchens, each situated on the ground, first and second floor respectively, and can cater for a range of dietary requirements to suit each and every client’s needs. Contact our dedicated staff today on 031 337 1110, and let their service excellence help in making your event a truly unique experience for your guests. 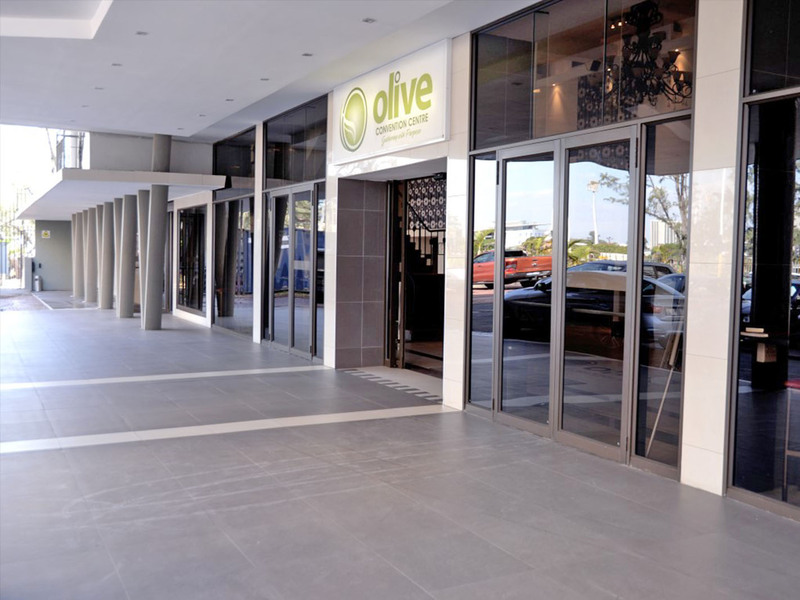 Opening its doors in 2010, The Olive Convention Centre has become a firm favourite in the conferencing and event arena, largely due to its placement within Durban’s Golden Mile and proximity to hotels, beaches and tourist attractions. Strategically positioned, metres away from Durban’s famous Golden Mile, The Olive Convention Centre is a 30 minute drive from Durban’s King Shaka International Airport, and within walking distance from the Moses Mabhida Stadium. The Olive Convention Centre offers parking on its premises which can accommodate up to 35 vehicles at the main entrance; however has a host of parking facilities within close proximity (10 meters to 300 metres) to the Conference Centre. During large scale events, the Hoy Park and George Campbell School grounds are utilised, which caters for approximately 500 vehicles. This parking is subject to availability and is within walking distance of the Convention Centre. Various directional noticeboards direct patrons to and from this parking. The Olive Convention Centre offers a free shuttle service between the parking zones and the Conference Centre to assist with the movement of your guests. I received very positive feedback from my team who oversaw the above event. It was also communicated to me that the placement of our official photographer in Hall 2 worked well. Likewise, I have been informed that the assistance provided by OCC staff was efficient, organised and friendly. I would therefore like to use this opportunity thank you and the OCC team for contributing to the success of our Durban 2014 Spring Graduation Series. Please convey our sincere gratitude to all staff involved. I would like to express my outmost gratitude for all the efforts you and your team have put to make the event a success. Please pass my regards to Philani, Krish, Glo, Zane, Gentleman who helped us with the AV and the entire team! Your efforts were very much appreciated . On behalf of Mvunonala Holdings, I would like to thank you and your colleagues for the assistance you gave us during the launch of the Soul Brothers CD. It was a success due to your contribution. If you would like to make a Booking Enquiry, detailing all aspects of your function. Wow...............blessed, inspired, revived .....by Sunday service. Everything I experienced was just amazing. God bless you all. Great conference centre, theres a amphitheatre located here. Come here for great events and functions. Not a lot of parking but bring the kids with to go for some ice skating. Very close to the Durban ICC, the Hilton and the beach. Enjoy meals from local restaurants or fast food places. Theres a bottle store loacted here with a spar. Attended a workshop here. Very impressed with their facilities.